If you are in the market for a used car, you must get a Vehicle History Report AND have the car inspected by a certified mechanic on a lift. Do not buy a used car without these two very important pieces of information. Making an educated decision on a used car purchase can save you thousands of dollars. Don't make a huge mistake. You have been warned! You Need More Than a Record Check and Record Summary! It gives you a window into the car's past. According to the US Government roughly a half million cars are sold with fraudulent odometer readings annually, costing used car buyers over a billion dollars. Our research indicates many more go unreported! The Office of Odometer Fraud Investigations has reported a sharp increase in odometer fraud. Elevated used car prices coupled with a tight supply of low-mileage used cars, has made odometer fraud more profitable than ever. Natural disasters such as Super Storm Sandy damaged over a quarter million cars! Many of these cars get cleaned up, rebuilt and put back on the market. Number of previous owners, when it was sold & what states it was sold in. Check if the car has been turned in under the "Lemon Law"
To get a better feel for what is contained in a report, click here to view a sample report. You'll be able to go through all of the sections and see how all of the valuable information is presented. Don't be fooled by empty reports that just give you generic data on a VIN. Some sites out there ask you a bunch of questions to make it seem like they need information to give you a complete report. Don't be tricked by this tactic! A real history report doesn't need to know what state you are in. Some sites out there will really try to make you think they are gathering information by having spinning wheels and status bars waste a bunch of time. These displays are just an illusion. Any legitimate report will be pulled in seconds from information in a database. No free report will give you the information that you really need. They might give you a lot of information in a slick format but it is not the important information you require before buying a used car. You can get the information contained in one of these "free" reports by yourself without much difficulty. Don't get a free vehicle history report and buy a car because the history was "clean" and then send us email in a few weeks when you discover that it was in a wreck that you didn't know about. We have received several emails from CarBuyingTips.com visitors where the seller provided a vehicle history report, only to later find out the car had been in an accident! How can this happen? The report could be out-dated, altered or fake. Why would you trust the seller to show you an accurate report? Spend the money and run your own current report. You're about to spend thousands on a car, why take the risk for less than $50 bucks. Not so long ago an unscrupulous dealer got arrested just around the corner from my house for creating fake reports and giving them to their customers - unsuspecting car shoppers like you. It takes some time for data to get into a vehicle history report. Accident data is especially tricky because of all the paperwork involved. A shady dealer can pull off a simple trick. The dealer can buy a car at auction or take in a trade that they know has been in a recent accident. Now, if they run the report quickly, the accident data hasn't been added yet. All they need to do is hit print and slap that "clean" report on the window. If the damage hasn't been repaired, they have the body shop fix it up. Having your own, most current, report can prevent this scam from being pulled on you. Your report will be newer and much more likely to have the data you need. Your options for a report provider will fall into two categories. 1) Companies that buy as much data as possible about a vehicle and give you a lot of information that you can use to evaluate the car that you may be considering. 2) The very low cost reports that have data from very limited sources supplied by the Federal Government's National Motor Vehicle Title Information System (NMVTIS). When you use an NMVTIS provider you only get very basic information. CarBuyingTips.com reminds you that you get what you pay for? That is especially true when you are talking about this topic. Even though we don't really recommend it, for more information about NMVTIS and how to get a report from the Government database, click here to visit VehicleHistory.gov. If you are going to take our advice and stick with a complete report we recommend AutoCheck because they are the only provider that has a true high volume plan. Reports can be run at your convenience and they have mobile apps for both iPhone and Android so you can run them no matter where you are. You'll be able to run reports while you are out looking at cars. The 25 report package empowers you to be a discerning used car buyer. If there are no major problems found in the report, you can use the information to help you to determine what the car is worth. Before doing this, you need to get a baseline value from Kelley Blue Book. Once you have the baseline, you can use the data about the car to determine if you should pay more or less than "normal" for that particular vehicle. For more information about this topic, read our advice about how to use a report to haggle a lower price. and run reports at your convenience. 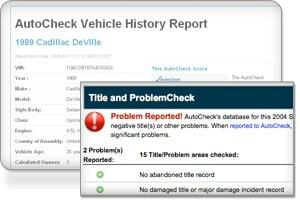 AutoCheck is a premier vehicle history report product. It is supplied by Experian Automotive which is a wholly owned subsidiary of Experian (the credit report people). AutoCheck reports feature data from over 34,000 sources and provides the "AutoCheck Score" (in addition to the detailed records) which helps you negotiate a better price and compare vehicles. They don't advertise nearly as much as CARFAX® but that just means they can pass the savings on to you. For example, for a single report, CARFAX® charges $39.99 while Autocheck only charges $24.99. In the next tier, CARFAX® charges $49.99 for five (5) reports while, you will get 25 reports from Autocheck for $49.99. Click here to get a 25 report package from AutoCheck. In addition, you can click here to learn more about why we recommend AutoCheck based on the extensive research that we have conducted. AutoCheck has an excellent buyback guarantee. 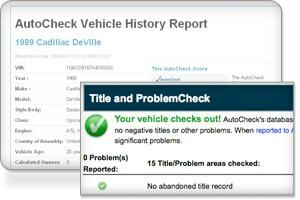 If a problem title is found at a later date on a vehicle that shows a "Clean Title" in their system when you ran the report, they will buy the vehicle back from you. Unfortunately there are over 2 million car wrecks each year. Even used cars that are "certified" may have accidents or other issues in their past. Without a used car history report, your chances of buying a wreck are high. Every day I receive emails from buyers who have become a victim. Learn from the mistakes that others have made so that the same mistakes won't happen to you. Some local governments don't supply accident report data to the report providers and some accidents where the damage is under $1,000 go unreported. No history report is foolproof. That's why I stress so much that you still need a certified mechanic to look at the car on a lift to find accident damage not reported in the report. These reports are only as accurate as the data they are based on. Many people wrongly think digital odometers can't be rolled back. With digital odometers, the current mileage reading is stored in a memory chip. A skilled scammer can reprogram it with lower mileage, so you should run an AutoCheck Report on the car to know for sure. A car's mileage is recorded when it's inspected, title changes hands, traded in at a car dealer, turned in after a lease and sometimes when the vehicle is in for service. As you look at a report, the recorded mileage should increase each year. If a mileage event shows less mileage than the last event, this should alert you to potential odometer fraud. Airbag fraud is widespread and very profitable. When cars are wrecked, insurance companies pay for damages including airbag replacement. Some unscrupulous repair shops take the money without replacing the $800 airbag. Many companies sell fake airbag covers so that you falsely think you have an airbag. Could you be driving around in a car with no airbag? You can't see through the airbag cover. That's why you need to know if the car was wrecked. If the car had previous accidents on its history report, you should be suspicious and have a certified mechanic verify that airbags are properly installed. In some cases, the report can tell you if the airbag was deployed in an accident. 10. You Need More Than a Record Check and Record Summary! Don't just run the free record check and think your job is done. That's just a teaser showing you how many records exist for that car, so run the full vehicle history report to see the car's complete history.